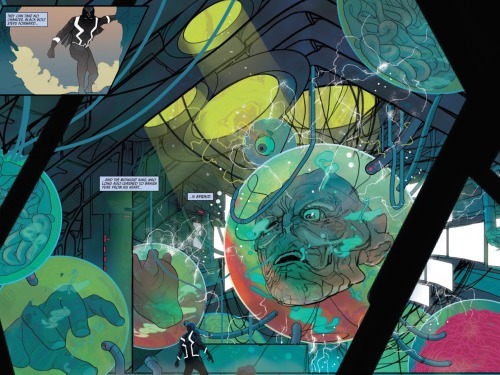 It’s another wild and gorgeously rendered installment of Saladin Ahmed and Christian Ward’s Black Bolt. Maximus’ trickery has left Black Bolt stranded in a strange cosmic prison nestled off in the corner of some far off galaxy. The prison is lorded over by the immensely powerful Jailer and his chief lieutenant, The Spyder. Black Bolt has made allies among his fellow inmates, specially Crusher ‘The Absorbing Man’ Creel, The Metal Master, a Skrull pirate named Raava and a telepathic alien child incarcerated simply due to poor circumstances named Blinky. Black Bolt has agreed to participate in a break-out and no sooner than he agrees then the plan is engaged. The Metal Master has somehow regained the use of his magnetic powers which he employs to tear open the cell holding BB and his new allies. It’s a good first step, but only a first step and if they are to make it all the way to freedom they are going to need to regain the use of their own powers. 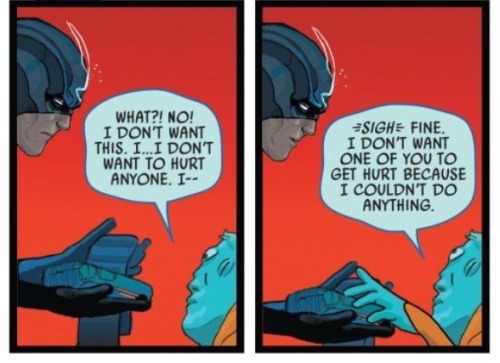 This is Black Bolt’s role in the scheme. He has to take on The Spyder, defeat the villain and procure from him a box-like device that works the prison’s power dampeners. 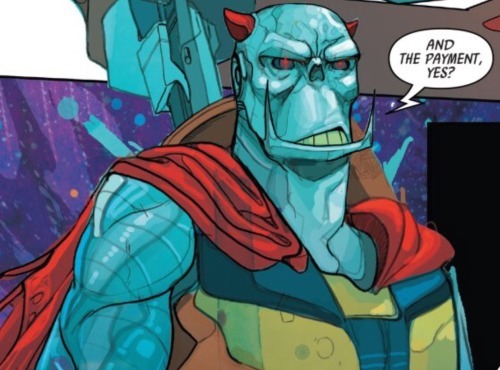 Searching through the labyrinth of the prison, Black Bolt comes across the Spyder, who is in the process of paying the intergalactic bounty hunter, Death’s Head, for his delivery of a new inmate. Death’s Head originates from marvel comics United Kingdom imprint; although he has only appeared in a handful of comics here in the States, the cyborg mercenary enjoyed a good deal popularity overseas. He’s also a total badass and, without his powers, BB really has no chance against him. The matter aside, Black Bolt leaps into action, attacking The Spyder and taking the box from him. The Spyder orders Death’s Head to attack and a firefight ensues. BB is outmatched, yet before Death’s Head can go in for the kill a slight signal goes off. The signal indicates that the transfer of funds that Death’s Head has been paid for delivering new prisoner has successfully gone through. The cyborg is only interested in fees for service and now that he has been paid his interest in the affairs of the prison is over. He disengaged from Black Bolt and goes about his merry way; leaving the Spyder at Black Bolt’s mercy. Having accomplished his task, Black Bolt rejoins the others. Young Blinky embraces Black Bolt, so happy to see him. It’s a neat scene that highlights artist Christian Ward’s skill for relating story and emotion in subtle facial features. It’s quite clear that Blinky is very much in need of a parental figure; as is it clear that BB is quite uncomfortable fulfilling this role. It looks quite likely that we are going to get to see a lot more of the father/daughter relationship developing between these two as the series progresses and I’m quite looking forward to seeing how it goes down. 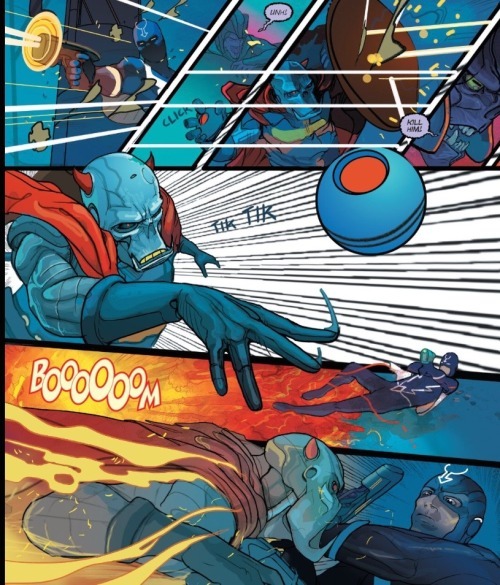 Disabling the control box returns Black Bolt and the others their powers. 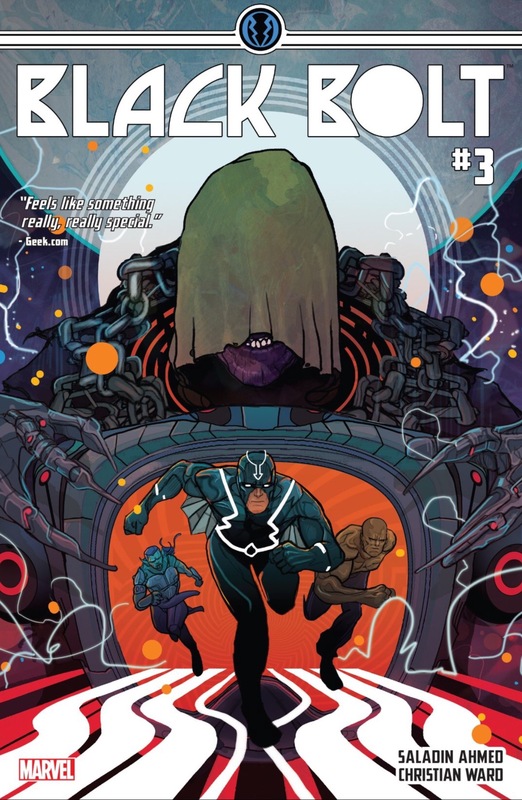 Which is fortunate fore as Black Bolt and his colleagues open a new corridor then come face to face with the giant creature known as Monstroso (the new inmate that Death’s Head had delivered to the prison). Rather than fighting the behemoth, Blinky uses her psychic powers to communicate with it. It turns out that the creature is little more than a child whose destructive acts were simply the results of his being scared and separated from his parents. They leave the child-like Monstroso in peace. Raava expresses her annoyance that they opted not to recruit the creature to their cause; The Metal Master retorts that using the creature to their bidding would make them no better than the sinister Jailer who has toyed with them all with such cruelty (though the explanation does little to assuage Raava’s bemusement). 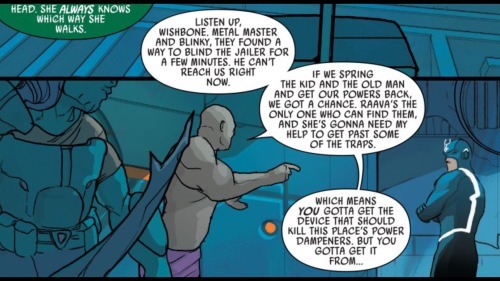 As for Black Bolt, he in no longer interested in simply escaping. This whole torture chamber of a prison is an effrontery to his sensibilities and he is now committed to destroying The Jailer and bringing an end to his sadistic ways. Venturing deeper into the shifting labyrinth of the group come across what appears to be an enormous engine. Creel (showing a bit more insight than one might expect from him) ascertains that the whole thing is a power cell, a dynamo through which The Jailer fuels himself, feeds, off the anguish and pain that he subjects to his inmates. The Jailer is some sort of psychic energy vampire who gains sustenance from the pain brought about from killing and resurrecting his prisoners. The resulting sonic blast knocks the jailer through a wall, opening up into a large antechamber where The Jailer’s true being resides. The Jailer’s body as we have seen it thus far appears to be little more than an automaton… a psychical vessel for his psychic powers. The true Jailer is a series of organs, brains, eyes and hearts each contained within orbs of crackling psychic energy. Somehow these disparate, dissected organ work in concert, wielding an awesome power. The sight of it, the raw power created by this grotesque mechanism, strikes fear into Black Bolt’s heart. Yet this fear will not stop him and Black Bolt rats forward, attacking the being head-on. And it is with Black Bolt’s valiant thrust into action that the issue comes to a cliffhanger end, to be continued with the next installment. Ahmed and Ward’s tale continues to be the kind of Inhumans book I have very much longed for. It feels less like your typical Marvel Comic and more like a neat science fiction tale one might come across in an old issue of Métal Hurlant. The ideas and visuals make for a bizarre feast for the mind and eyes. Although Ahmed draws a lot of random characters from Marvel’s backlog, the story stands very much on its own. It’s kind of like an Image Comic that’s been furtively snuck into Marvel. Ahmed is still building upon and developing the characters who make up the ensemble cast. At times this process ends up a little heavy on the dialogue, with a bit more spoken exposition than is necessary. Yet I don’t mind it in that the characters themselves are rich and a lot of fun to get to know. Whereas Crusher Creel kind of stole the show last issue, Raava takes over some of the spotlight in this issue. She’s fascinating; I’m really digging her. This is not to say that Black Bolt himself isn’t being offered further character development. Unlike his newfound colleagues, BB’s development is handled with a good deal more subtly. Ward’s style is a bit minimalistic when it comes to facial expression, yet he still manages to relay a great deal with the few lines he utilizes. BB’s feelings are easy to read on his face. He’s no longer a king, but that sense of responsibility and need for justice is still a significant part of who he is. He is determined to end The Jailer not just for what the Jailer had done to him, but rather because he is a blight on the universe and BB feels it his duty to end this menace. 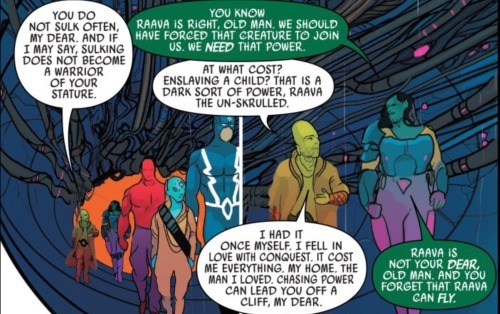 Yet, while fulfilling what he sees as his kingly duties comes naturally to Black Bolt, being close with others, the bond he has forged with Blinky and his colleagues seems to strike him as unfamiliar and difficult. Creel’s playful banter, Raava’s flirtation and Blinky’s affection all seem to make BB bristle and he reacts in a clumsy fashion to it, It feels like, though he is unaccustomed to such closeness, what is actually jarring about it all is that it is nice, that it’s something that he actually wants. The action is all exciting and wonderfully, richly depicted… yet it is BB’s emotional, interpersonal journey that I find myself the most interested in seeing more of. 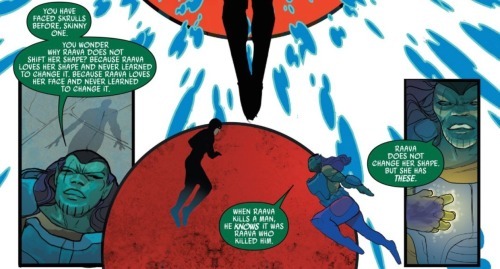 Although a Skrull, Raava chooses not to utilize her powers for shapeshifting. She had never leaned to cultivate this power and explains that it is because she likes how she looks and has no interest to altering it. It’s not exactly a good decision on a tactical level, but has a nice body-positive feel to it. Rather than shapeshifting, Raava possesses powers not usually seen in Scrulls, such as the ability to fly and generate energy swords. Each of her swords are named after her dead son and daughter. It was an interesting twist to hear that The Metal Master had once had a husband. Some might roll their eyes over what they see as the progressively-mandated mindset of including a gay character into he cast. Yet, keep in mind that The Metal Master heralds from an alien world and the idea that heterosexuality is the de facto norm on other worlds is a presumptive fallacy. Monstroso is one of the lessor known entries of the bevy of monsters that Kirby, Ditko and Lee created in the early issues of Tales to Astonish. Monstroso himself first appeared in a backstory to Tales to Astonish #18 written and illustrated by Steve Ditcko. The creature also made a brief appearance in the much more recent Monsters Unleashed miniseries. Although, given this version of Monstroso’s more child-like nature, it is possible that he is the offspring of the original Monstroso. It remains unclear what exactly The Jailer is and how he came to be. The dissected pieces that work in concert to generate his powers must have been built by someone or something; and I’m not sure if or when we will learn how he came to be. The technology employed in the prison is of a higher order than anything we have seen from such peoples as the Kree or Shi’Ar. The whole matter remains a mystery. Fans of Death’s Head will appreciate that Ahmed’s dialogue is very much in tune with the signature cadence of how the character talks. 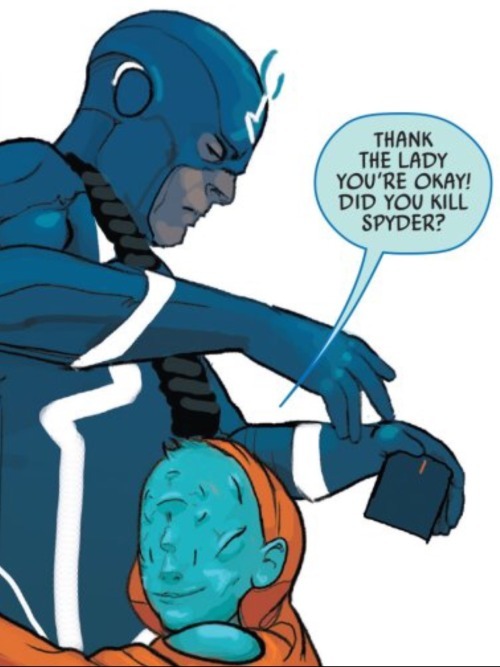 Blinky’s telepathic powers will allow her to continue to communicate with Black Bolt now that he has his powers back. Ward illustrates Black Bolt in his own unique way. His costume appears quite a bit different compared to his original outfit as well as the redesign he’s been sporting of late. I quite like Ward’s take on BB’s look, although I’m not that into how he draws BB’s wing’s. Rather than the accordion bat-like wings, Eard draws BB’s wings as being more like a slight filament that generates from his wrist to hip, appear and disappearing as needed. It’s a neat looking effect, but personally I prefer the bat style wings. Christian Ward sneaks in a neat homage to fellow artist, Steve McNiven, in the scene where BB first enters into the antechamber where the Jailer’s true form resides. 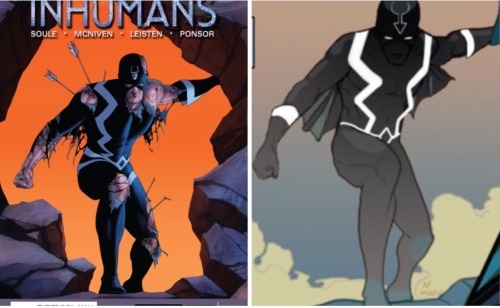 Black Bolt’s silhouette is reminiscent to the cover art McNiven provided for Uncanny Inhumans #0. Another can’t miss issue. Five out of five Lockjaws! Black Bolt #5 Review – WHO’S A GOOD PUPPER? !